Canon has introduced the Canon EOS 6D Mark II, 5 years after the Canon EOS 6D, here we look at the differences between the two cameras. Externally, the cameras look very similar, but there are a number of changes that have been made, mostly on the inside. External changes include a new vari-angle touch-screen, relocation of the flash sync socket (to the front), plus the addition of a focus button, next to the shutter release button. 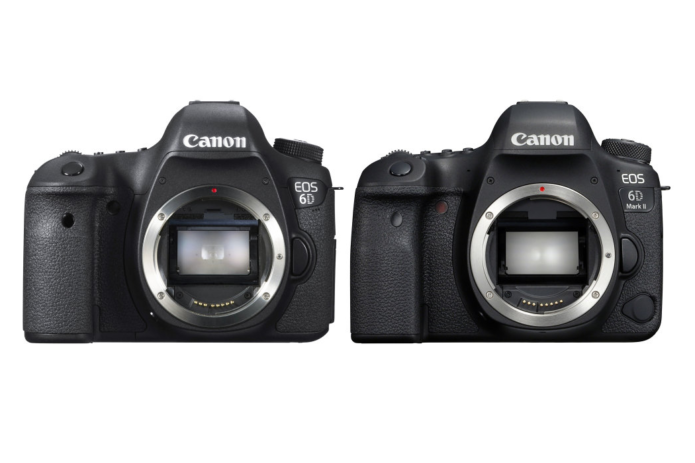 The 6D features the DIGIC 5+ image processor, whilst the 6D Mark II features a new DIGIC 7 image processor. Canon has said that the higher resolution 6D Mark II should deliver better noise performance, thanks to the latest generation sensor technology and image processing. Continuous shooting speed has been improved, as well as the number of shots possible before slowing down, with a larger buffer.